LISTEN FOR THE BIRDS OF BROOKLYN! Brooklyn artist Jenna Spevack has created a community-based audio artwork that brings the sounds of Brooklyn’s displaced, endangered, and bygone birds to various sites around the borough. From 8am to 8pm, bird songs that are rarely heard in densely populated Brooklyn neighborhoods are projected from participating Host locations. Neighborhood residents and passersby will hear twenty different recordings, including the Ring-necked Pheasant, Grasshopper Sparrow, and Eastern Blue Bird. The project aims to reconnect city dwellers with the natural sounds of the area and raise awareness about declining bird populations in urban environments. In consultation with members of the Brooklyn Bird Club, a selection of bird sounds was chosen to highlight birds that are not commonly heard on the streets or shores of Brooklyn, but may have been at one time. Although some of the birds are common outside of New York City or in local parks, many are threatened or have been extirpated from the Brooklyn area due to urban development, pesticides, airport management practices, climate change, as well as shrinking grasslands, marshlands, and forests. Many neighborhoods in Brooklyn lack green space for bird habitat. Residential neighbors often coexist with industrial or commercial sites and birds are either drowned out or absent due to development and pollution. By constructing an aural landscape that “greens” the concrete physical environment and gently reintroduces the sounds of former bird residents, the artist hopes awareness will inspire Brooklynites to support their bird neighbors. The Birds of Brooklyn is currently installed at several Host sites, including: Brooklyn Design Lab in Park Slope, Mile End Delicatessen in Boerum Hill, ShyBirdy in Williamsburg, Sweet Melissa’s in Carroll Gardens, Lava in Prospect Heights, Monti Studios in Crown Heights, 33 Flatbush in Downtown Brooklyn, and Willowtown Gardens in Brooklyn Heights. 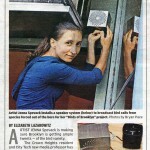 Visit birdsofbrooklyn.org for the Sitings Map and take a moment to LISTEN for Birds of Brooklyn! Birds of Brooklyn is sponsored, in part, by the Greater New York Arts Development Fund of the New York City Department of Cultural Affairs, administered by the Brooklyn Arts Council.